What Else Can I Expect From an Online Master's in Organizational Leadership Program? Organizational leadership is a niche area of business administration that is primarily concerned with communication, human resources (HR) and professional development within the company framework. Areas of focus in this broad field include behavioral science, organizational psychology, workplace ethics and social responsibility. Many organizational leadership professionals begin their career by earning a master's degree in this cutting-edge field. This educational pathway is often seen as an alternative to the Master of Business Administration (MBA); while most MBA programs take a more analytical approach to corporate management, organizational leadership master's programs emphasize the importance of creativity, interpersonal effectiveness and establishing personal connections in work environments. While most careers in organizational leadership are found within the corporate sector, the field also has applications in the public and nonprofit sectors. How do you prepare to run your own business? Learn from those with experience and a history of success. Most master's in organizational leadership degree programs follow a multidisciplinary curriculum that incorporates elements of HR, information technology (IT), business analytics, law and ethics, project management and other related fields. These programs often culminate in a capstone project, which requires students to use the skills and knowledge they have gained to solve a complex, business-oriented problem. Many of today's students are choosing to earn their master's in organizational leadership online. Web-based students follow the same rigorous course schedule as their brick-and-mortar counterparts, leading to the same number of job opportunities for successful graduates. The asynchronous (or self-paced) structure and convenient study-from-home format of most online programs is also ideal for students with part-time jobs, childcare duties and other commitments that may interfere with campus-based coursework. Learn more about what you can do with an online master's in organizational leadership and what kind of career opportunities you can look forward to with this comprehensive guide. Organizational leadership is an area of business concerned with effective operations and management, which covers areas such as communication, human resources, personnel training, and professional development. Read more here..
With a master's in organizational leadership, you can pursue a variety of business careers in areas such as management, human resources, business operations, and business development. Read more here.. Yes. Professionals with a master's in organizational leadership can earn a median salary of $52,400 during their first five years and $85,000 after 10 years on the job, which is roughly 20% more than what bachelor's degree-holders earn during those same periods. Read more here.. Yes, but it differs from an MBA in important ways. A master's in organizational leadership emphasizes the importance of creativity, personal connections in work environments, and interpersonal communication skills. Read more here.. This depends on an individual's goals and interests. Compared to an MBA that emphasizes analytical and quantitative skills, an organizational leadership master's emphasizes soft skills that lead to effective management. Read more here..
Will an Online Master's in Organizational Leadership Program Provide Me With the Skills I Need to Advance My Career? Online organizational leadership master's programs teach students how to optimize organizational communication, mitigate workplace conflicts and help employees overcome various obstacles and personal issues. Coursework delves into topics like administration, human resources, information technology and change management. As students master the fundamentals of organizational leadership, they will be given numerous opportunities to apply their knowledge to case-studies and real-world scenarios. Will an Online Master's in Organizational Leadership Program Work With My Schedule? Master's in organizational leadership online programs offer a flexible, easily accessible alternative to traditional college education. Students can download course lectures and readings, participate in virtual discussions with other students, submit written assignments, take exams and communicate with their professors from the comfort of their home computer. Current technology also enables them to study on the go using a laptop, tablet, smartphone and other portable devices with Wi-Fi capabilities. What Jobs Can I Get With My Master's in Organizational Leadership? Many corporate careers are available to organizational leadership master's degree recipients. The most popular job titles include management consultants, top executives, human resources managers and specialists, office administrators and training and development managers. Those with a master's in organizational leadership may also work for government agencies, nonprofit organizations or healthcare facilities. 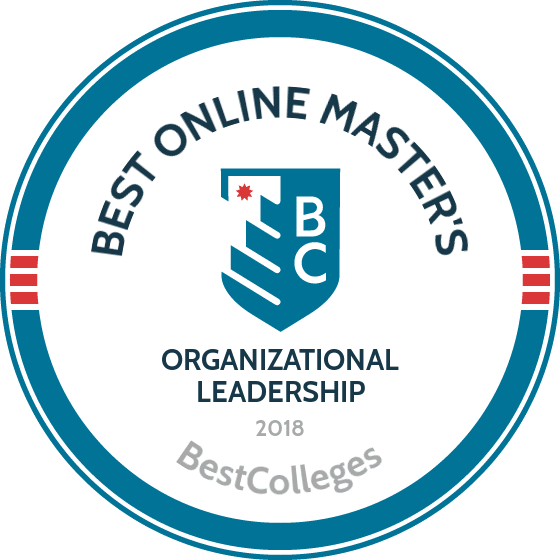 What Are the Best Online Master's in Organizational Leadership Programs? Choosing a program is an incredibly personal decision, and only you can properly evaluate whether a target school's strengths match your educational needs. The following ranked list of schools should serve as a helpful starting point in your search for the best online master's in organizational leadership programs in the United States. If you are considering an online master's in organizational leadership, be sure to contact admissions specialists at different colleges and universities to learn more their about specific requirements and offerings. Johns Hopkins University offers an online master's in organizational leadership that is geared specifically toward public service professionals. The university collaborates with several public service agencies, including Immigration and Customs Enforcement (ICE) and the Maryland Chiefs of Police Association, to best prepare students for success in the field. These partnerships have resulted in more than 70 police chiefs graduating from the on-campus program since its inception. Graduates are prepared to pursue public safety leadership roles in a variety of industries, including law enforcement, public health, emergency management, corrections, and more. This 36-credit program is offered through the School of Education and the Division of Public Safety. The curriculum includes courses on a variety of topics, including management, administration of public sector organizations, and the mastery of leadership. The program also includes a leadership component that touches on everything from ethics and integrity to managerial economics. Students complete a final capstone class that uses individual and group projects to develop creative solutions to real organizational problems and create a professional plan for their post-academic career. Johns Hopkins’s online master's of science in organizational leadership program was designed specifically for adult learners, and the program takes into account the necessary balance between work, school, and pursuing your degree. The university is dedicated to helping students effectively manage their courses and provides faculty mentoring services both electronically and over the phone. Students typically complete the program in two years by enrolling in two to three classes each semester. Admission to the program is selective, including a review of each applicant’s professional experience and an interview. Application requirements include a bachelor's degree with a minimum GPA of 3.0 and the submission of an essay, resume, disposition survey, and two letters of recommendation. George Washington University is located in the District of Columbia. In 1821, congress initially chartered GW as Columbian College, which later became Columbian University, and finally, George Washington University in 1904. The university hosts more than 450 student organizations, including the nation’s largest chapters of College Republicans and College Democrats. Famous alumni include former Secretary of State Colin Powell, First Lady Jacqueline Kennedy Onassis, and FBI Director J. Edgar Hoover. GW offers a 30-credit, online MA in organizational leadership and learning that students can complete in nine semesters. The school utilizes an interdisciplinary approach and tailors coursework to each learners’ specific needs. Students take 21 credits of core courses, which includes organizational change, human behavior, and leadership. Learners also choose between nine, three-credit electives to earn the remaining nine credits. Elective courses allow students to specialize their studies. GW does not require a capstone project, but program enrollees can choose to complete an independent research course as an elective. The master's in leadership online program requires prospective students to fill out an online application and submit a statement of purpose, two letters of recommendation, and unofficial college transcripts. GW charges a flat tuition rate regardless of a students' location. The school also charges the same tuition for online courses and classroom studies. Located in Boston, Massachusetts, Northeastern University offers an online master's in organizational leadership through its global network that is tailored for working students. NU developed the master’s program to improve individuals’ leadership skills and abilities. Prospective learners who earned the Society of Human Resource Management-CP or SCP certifications qualify for transfer credits. NU grants three quarter hours of transfer credits and eliminates one required course for SHRM-CP certifications. The school grants six quarter hours and eliminates two required courses for SHRM-SCP certifications. The 45-credit MS in leadership degree requires students to take at least 15 courses, which includes eight required courses, a capstone, and one elective. Students also focus on one of seven concentrations, such as health management, human resources, and organizational communications. Each concentration requires learners to earn between 14 and 16 credits. Required core courses include leading teams, developing leadership capabilities, ethical leadership, and strategic leadership. Students also complete a required elective through either an international field study experience, a negotiations class, integrative experiential learning, or personal and career development. To complete the capstone, students create a case study and corresponding analysis, conduct field research, and use relevant course materials to justify their recommendations. NU is a private school and charges the same tuition rate for in-state and out-of-state students. Students interested in applying to this program should submit an online application, a personal statement of intent, one to three letters of recommendation, and college transcripts. The University of Alabama in Tuscaloosa has some of the best online graduate programs. UA online students can earn an MA in communications with a specialization in organizational leadership from the state’s oldest public university. The 30-credit master's in leadership online program does not require a math component, and full-time students can earn the degree in two years or less. The curriculum consists of 12 credits in the leadership specialization, 12 credits in core theory courses, and six credits in research. The research component includes a three-credit professional project in which students design and execute research studies that demonstrate their understanding of research methods. Students submit a capstone project portfolio after they finish all coursework and their respective professional projects. The capstone consists of either a professional internship or a supervised professional project. Learners must submit a professional project plan to their academic adviser no later than the second week of their second semester. After completing the project or internship, students submit a written report of their learning experiences. UA accepts program applications year round and charges the same tuition rate for online courses, no matter where learners reside. Applicants must fill out an online application and submit transcripts that prove they earned a minimum 3.0 GPA during the final 60 credits of undergraduate work or during a graduate program. UA requires a minimum score of 300 on the GRE’s verbal and quantitative portions or placement in the 50th percentile or higher on the MAT test. Prospective learners must also provide a statement of purpose and three academic references. Colorado State University is located in Fort Collins. The school's online learners do not have any on-campus requirements, and state residency is not required to earn an affordable online master's of organizational leadership. CSU charges a single tuition rate for its online, global campus courses. Active-military personnel, veterans, and their family members earn an additional tuition discount. CSU’s MS in organizational leadership prepares learners for upper-level management and provides flexibility for working students. Graduates learn to utilize organizational resources and reduce operations costs while improving worker efficiency. Many learners pursue careers in human resources and upper-management. CSU enables accelerated studies for full-time students, while working students and those with family commitments can start classes during any month and finish them on their own schedules. CSU’s online master’s program requires students to earn 36 credits. Learners choose either a practitioner tract or a research tract, both of which include an internship, in addition to eight, three-credit courses. The practitioner tract includes a capstone component, which CSU does not require through the research tract. Students demonstrate their mastery of learning concepts by analyzing case studies and applying the core curriculum to the research project, which they complete after satisfying all other coursework. Prospective students apply for admission online and submit transcripts from their undergraduate degree programs. CSU prefers those with bachelor’s degrees and at least a 3.0 GPA from a regionally accredited school. The school does accept students with a lower GPA. Applicants also submit a statement of purpose and a current resume; a 30-minute online admissions assessment is also required. Gonzaga University was founded in 1887 in Spokane, Washington, by the Society of Jesus and is one of 28 member institutions of the Association of Jesuit Colleges and Universities. The school offers an online master's of organizational leadership that teaches students skills in project management, team building, communication, conflict resolution, and leadership practices. This 30-credit online master's in organizational leadership allows students to choose an optional concentration in change leadership, global leadership or servant leadership. Students in these concentrations will learn how to align their teams around shared goals, apply models for organizational change, and become successful leaders. The servant leader concentration is inspired by the Jesuit concept of “people for others” and focuses on key skills like restorative justice and community building. The global leader concentration prepares students for international work environments and requires students to participate in 1-2 week study abroad experiences in locations like Colombia and Belgium. The change leadership offering prepares students to use real world tools to lead change in all levels of an organization by empowering teams. The online master's degree in leadership program is offered online with on-campus opportunities and can be completed in two years. Online classes are delivered asynchronously and generally last about eight weeks. The program also includes a required three-day on-campus residency experience that helps distance learners build community with faculty, advisors, and their peers. Students can transfer up to six credits from another institution as long as they are at least a "B" grade and have been earned in the past five years. Gonzaga offers a variety of resources to distance learners through the school's online career services network, including assistance with creating resumes, findings jobs, and networking. The Gonzaga Alumni Mentoring Program also allows graduates to build relationships with other professionals in their respective field. Applicants must have a bachelor's degree with a minimum GPA of 3.0 to be considered. The University of Oklahoma, located in Norman, is a public research university that predates the state’s admission into the Union. It contains some of the region’s oldest and most historic buildings. OU’s MA in administrative leadership program teaches individual leadership and helps organizations improve their organizational leadership capacity. The degree expands students' self-awareness while developing individual and group leadership skills. The program also offers three specialty tracks. Students progress through four educational tracks, and each is comprised of six to nine credit hours of studies. This program does not have any on-campus requirements. The first learning phase teaches interdisciplinary organizational studies, followed by core leadership classes during the second phase. Students choose a leadership track for more focused studies during the third learning phase. The leadership tracks cover organizational leadership, nonprofit and volunteer leadership, or government and military leadership. The fourth phase concludes with either a thesis, six credits of approved electives and a written comprehensive exam, or an experiential leadership completion program with a written comprehensive exam. All courses last 16 weeks, and learners must complete 33 credits to earn their degree. Full-time students can complete the program in two years. OU designed the program to support working students, who can tailor their coursework to match career goals. Azusa Pacific University is a private, evangelical college that offers an online master's in organizational leadership degree. APU also has seven regional learning centers in southern California, and one of the nation’s most diverse student bodies. The university’s MA in leadership and organizational studies degree enhances professional development by catering to working adults looking to advance their careers by obtaining leadership positions. Online learners take one class at a time, and complete two courses each semester. The curriculum consists of 11 courses. Students must pass each course with a minimum 3.0 GPA. The self-paced program enables students to accelerate their studies and earn their degree faster. The program integrates the Christian faith into individual studies. Working students can use their current organization as a laboratory settings to complete various projects, which improves organizational efficiency and productivity. Students learn principles of organization and business methods, while completing at least 33 credits. Learners also incorporate their life experiences and professional careers into their studies. Courses include research in organizations, managerial marketing, organizational behavior, human resources, and strategy and planning. Azusa does not require a capstone or other special project to earn the degree. Prospective students must submit official transcripts from regionally accredited schools. Azusa requires a minimum 3.0 GPA during undergraduate studies. APU charges the same online tuition rate for all students, no matter their location. The school also supports active and reserve military, veterans, and their spouses with additional tuition help. Regis University was founded by the Society of Jesus in 1877 and is one of 28 member institutions of the Association of Jesuit Colleges and Universities. Today, the school offers a variety of distance learning programs, including a master's in organizational leadership online. The master's of science in organizational leadership and management (MSOL) prepares students to become effective leaders in an evolving global marketplace. The program's goal is to cultivate leaders who can both recognize problems and capitalize on opportunities to deploy creative solutions. The curriculum for the 30-credit MSOL program at Regis emphasizes management best practices and developing ethical leadership tactics. Students are challenged to think critically, work closely with their peers, and promote positive organizational and community change within their organizations. The master's in organizational behavior online program is also focused on building socially responsible leadership in an international work environment and requires students to complete a culminating capstone class on responsible organizational leadership. Students can pursue a dual specialization by adding one of the four following specializations to their MSOL degree: enterprise resource leadership and planning, human resource management and leadership, or organization leadership and management. Enterprise resource leadership and planning emphasizes a broad systems perspective, human resource management focuses on the optimization of human capital to achieve organizational goals. Finally, the organization leadership and management specialization dives deeper into organizational processes. Courses are offered completely online in an 8-week accelerated format. The program offers multiple start dates throughout the year, including the months of January, March, May, July, August, and October. Applicants should have a minimum GPA of 3.0 during their last 30 credits hours of academic study, have at least two years of work experience, and submit GMAT or GRE scores to be considered. Brandman is a private, nonprofit university that was founded in 1958 and is located in Irvine, California. Brandman has more than 25 location in California and Washington state. The school charges a flat tuition rate for its online master's of organizational leadership program. Learners choose between an online or hybrid format; the hybrid format is only available at 21 of the schools. The MA in organizational leadership program teaches leadership concepts, theory-based critical analysis, ethics, and change-management strategies. Students personalize their studies with electives, which includes education, criminal justice, human resources, and health administration. The program consists of 12 credits of theoretical organizational leadership studies, leadership practices, and 12 graduate-level credits. Graduates present an integrative study illustrating their understanding and mastery of course theories and concepts to satisfy a three-credit capstone. Students must submit college transcripts. Brandman requires either a 3.0 GPA during the most recent semester or quarter of undergraduate studies, or a minimum 2.5 GPA and a minimum scores on a graduate-admissions exam. The university also accepts students who earned a master’s degree or higher from a regionally accredited school, and those who submitted professional evidence portfolios. Brandman accepts up to nine transfer credits from regionally accredited graduate programs and applies them toward electives. Active-military personnel, reservists, veterans, and their families also get up to 15 transfer credits for qualifying military courses. Students earning the UC-Irvine extension project management certificate with at least a B average receive 12 elective credits. WGU is a private, nonprofit, online university that was founded in 1997. Working students can accelerate their studies by applying their professional experience through WGU ‘s competency-based MS in management and leadership curriculum, which covers business acumen, leadership, and strategy. Each participant creates a personal degree plan to match work experience and professional goals. WGU assigns a mentor to each student and provides course mentors, plus support staff, to provide educational guidance. Students work with organizations to analyze and solve organizational problems to demonstrate the core competencies learned during the capstone course. Learners pass courses by demonstrating their mastery of core concepts in each competency unit. Passing a course is equal to earning about a B grade, and 63% of graduates complete their master's in leadership online degree in six to 18 months. WGU boasts being the nation’s only university to receive regional accreditation from four commissions. WGU has no residency requirement and charges tuition based on a six-month term, plus a flat rate for learning materials. Prospective students must submit transcripts from their undergraduate program. WGU does not waive admissions or program requirements based on prior experience, but it does assess transcripts for possible transfer credits. The University of Denver is a private institution with 12,000 graduate and undergraduate students and 300 academic programs. Founded in 1864, DU is the oldest active private university in the Rocky Mountain region. DU’s MS in leadership and organizations with a concentration in organizational development teaches the history, successes, and challenges facing organizational development. Graduates learn how to create assessment plans, analyze data, and present findings based on philosophies regarding change within organizational development. The program includes 12 courses and requires students to earn 48 credits, which consists of 20 core credits, 16 concentration credits, and 12 elective credits. Core courses cover leadership, 21st century organizational development, financing principles, and social research methods. Students complete either a capstone project or participate in one of two types of capstone seminars. Learners work on an individual research project that integrates course materials and concepts. Those wanting to enroll in the organization leadership program must submit transcripts from a regionally accredited school. Applicants must have earned a minimum 2.5 GPA over the last 60 semester credits or last 90 quarter credits of undergraduate studies. A statement of purpose, resume, two references, and other materials are required. DU does not require GMAT or GRE assessments for enrollment in the program. Students with graduate credits earned within five years of the start date with at least a B grade can transfer up to 12 elective credits. Transfer credits do not apply toward required graduate certificate requirements. DU charges the same online tuition rate, regardless of location. Lewis University, founded in 1932 by the Archdiocese of Chicago in Romeoville, Illinois, is a private, Lasallian and Roman Catholic school with more than 4,500 undergraduates and nearly 2,000 graduate students. The university offers an online master's in organizational leadership program with a flat tuition rate, regardless of location. The MA in organizational leadership program requires 36 credits, with courses offered in eight-week blocks. Students take 24 credits of core courses, which cover leadership and organizational management, and 12 credits of specialized studies. Learners finish coursework at their own pace. Many students accelerate their studies and complete the degree in less than two years. The program offers five concentrations for specialized learning, including higher education, nonprofit management, organizational management, and professional and executive coaching. Each concentration consists of four, three-credit classes. Learners must maintain a minimum 3.0 GPA to continue progressing through the online program. The curriculum does not include a capstone, practicum, or comprehensive examination. Lewis designs its online programs to support working professionals looking to advance their careers. Students can withdraw and re-enroll in the program as needed to meet changing life and work demands, without losing any credits earned. Lewis enables those who are uncertain about whether or not they can satisfy the organization leadership requirements to pursue certification studies. Any credits earned through a certification program can be applied toward program studies. Students must submit transcripts from undergraduate and graduate programs. Learners must have maintained a minimum 3.0 GPA over the last 60 hours of undergraduate studies. Two letters of recommendation and an essay detailing personal and professional goals are also required. The Congregation of the Holy Spirit founded Duquesne University in Pittsburgh, Pennsylvania, in 1878. In 1911, it became Pennsylvania’s first Catholic university. The private, nonprofit Roman Catholic school offers an online master's of organizational leadership through the McAnulty Graduate School of Liberal Arts. The online MS in leadership degree teaches critical thinking and effective communications, while enabling working professionals to advance their careers. Duquesne designed its online program to meet the needs of working students. The university accepts up to two graduate-level electives from accredited schools and other Duquesne graduate programs. Students must apply online and submit official transcripts, three letters of recommendation, and a resume. Students can start the 30-credit master’s program in August, January, or May, and proceed at their own pace. Full-time students often finish the MS in leadership degree in less than two years, but part-time students may take several years to finish. The curriculum includes courses that cover conflict resolution, leading others, and organizational communications. Learners also take 15 elective credits to tailor their studies to their personal and professional goals. The leadership core includes a leadership capstone in which learners demonstrate their mastery of organizational leadership concepts. Students synthesize their studies and show the extent to which they grasp conceptual elements, practical applications, and analytical approaches to solving an organizational leadership problem. Duquesne does not require graduate entrance exams to enroll in the MS in leadership program. The university charges a flat online tuition rate, but discounts tuition for employees at partnered organizations. Duquesne provides special support programs for active-military personnel, veterans, and their families. All students have access to an online writing lab and other support services. Norwich University offers one of the best online master’s degree programs in organizational leadership. The university’s master's of science in leadership (MSL) program prepares students to become leaders in a variety of professional settings. Students learn how to develop strategic outlooks, emotional intelligence, strong ethical convictions, and a passion for their organizations. Each student will develop their own unique leadership style while mastering the necessary skills for leading teams and creating positive growth in their organizations. Students in this online master's in organizational leadership enroll in six-credit courses one at a time, each of which takes 11 weeks to complete. Courses are offered asynchronously online, allowing students to complete coursework at their own pace. The curriculum covers a wide variety of core leadership concepts like organizational behavior, HR management, communication, and leading change. Coursework includes case studies and workplace-based projects that emphasize discussion-based learning, as well as analysis of current leadership problems and how they relate to a student’s personal and professional backgrounds. Online master's in leadership students can choose from four concentrations: organizational leadership, public sector/government/military leadership, human resources leadership, and leading change management consulting. Students will complete a capstone project that includes a final publication-quality paper for all concentrations except organizational leadership. Students in all concentrations will develop a leadership portfolio, which is used to reflect on the outcomes of core coursework and how they connect to a student's leadership goals. The 36-credit MSL from Norwich University can be completed in 18-24 months and offers start dates in March, June, September, or December. Distance learners can transfer up to 12 credits from another institution and members of the military or veterans can also earn up to six transfer credits for prior learning experiences. While the majority of coursework can be completed online, distance learners must fulfill a week-long residency requirement at Norwich’s campus in Northfield, Vermont. The residency occurs just before the final commencement ceremony and aims to build community between students and faculty. Excelsior College, a nonprofit, private school in Albany, New York, enables students to earn an MS in management online. The New York State Board of Regents founded Excelsior in 1971, with initial funding from the Carnegie Corporation and the Ford Foundation. Excelsior transformed into a private school in 1998 with a charter to operate independently of the state board of regents. It’s primary mission is to enable working learners and those with families to complete their programs as time allows. Excelsior has more than 36,000 undergraduate and graduate students and offers an MS in management degree online. Students take 30 credits and complete a business capstone at their own pace. The curriculum includes seven, three-credit core classes, which includes organizational behavior, human resources management, organizational communications, and project management. Excelsior waives up to six core credits when replaced by qualifying electives. The MS in management studies offers nine-credit concentrations in general business management, human resources management, mediation and arbitration, and organizational leadership. Students complete leadership electives that teach mediation, leadership, and change management. Learners demonstrate their knowledge of core concepts and program applications through a final business capstone. Prospective students must submit official transcripts, a letter of recommendation, and graduate school admissions examinations scores. Excelsior charges a single online tuition rate that is discounted for active-military personnel, veterans, and their family members. It also has discounted tuition for students affiliated with partnered organizations. The college offers interest-free, monthly tuition payment plans; financial aid; and scholarships. National University, founded in 1971 in San Diego, California, is a private, nonprofit school that focuses on supporting working adults. NU excels at working with active-military personnel and offers an online master's in leadership degree through a four-week course format that students complete at their own pace. National's MS in organizational leadership degree prepares learners to become effective change leaders at the international level, while enhancing personal success. The curriculum uses a collaborative, holistic educational approach, while combining leadership theories and practice. Graduates emerge as leaders capable of applying multiple approaches to solving leadership problems. Students must earn at least 54 credits and can transfer up to 13.5 credits from comparable graduate programs. Core courses include ethics, leadership, consulting, and analysis and decision making. Learners must take two graduate-level business and management electives or complete a specialization in community development. The community-development specialization covers four courses and consists of 18 credits. Concentration courses include global development, human environments, culture and change, and planning and evaluation. Students also complete a capstone project, which has them work individually or in teams to research a problem in the field. Learners collect data and present findings in oral and written form to organizational clients, students, and faculty. NU charges a flat tuition rate for its online courses; discounts and scholarships are offered to active-military personnel, veterans, and their families. Learners in the military can access classes online and at more than a dozen military bases. NU also provides more than 20 onsite learning locations for all students in California and Nevada. Established in 1818, SLU claims a rich history as one of the nation’s oldest Catholic universities. The school’s notable alumni include pioneers in academia, business, the arts, and politics. SLU offers students an excellent educational experience, with more than 13,000 students and over 20 top ranking graduate and undergraduate programs. SLU offers a master of arts in leadership and organizational development through the School for Professional Studies that prepares students for leadership roles. Created for working adults, the 36-credit MA comprises eight-week terms. Students can complete the degree in two-and-a-half years, taking one class at a time. Though the program requires students to complete courses in contemporary organizational leadership and ethical, evidence-based decision making, students can also choose optional electives that suit their unique career goals. Immersive coursework allows students to explore specific areas of leadership and HR. The online master’s in leadership makes use of cutting-edge video and discussion board technology, providing students a contemporary learning experience. Students complete courses both synchronously and asynchronously, in classes typically capped at a maximum of 20 students, ensuring that each student receives individual attention. Applicants must have a minimum undergraduate GPA of 3.0, a basic understanding of the Microsoft Office suite, and have worked at least 20 hours per week to be considered. They must also submit a short essay detailing their interest in the master's program. Faculty members of the School for Professional Studies review all applications. Located in California’s central valley, FPU embodies the area’s only accredited Christian university. Established in 1944 by the Mennonite Brethren Church with just 28 enrollees, FPU evolved into a vibrant learning community with five campuses, over 100 areas of study, and more than 4,000 students. More than 80% of FPU faculty possess doctorate degrees. FPU's master of arts in leadership and organizational studies delivers courses in an asynchronous format. The curriculum of the master’s in leadership online emphasizes in-demand professional skills to prepare graduates for executive management positions. Instructors incorporate real-life experience in the areas of leadership and organizational development. The 36-credit master’s degree consists of 33 class credits and one, three-credit capstone project. Students complete each course over eight weeks, finishing the degree in just two years when taking one course at a time. A collaborative interface provides easy access to online courses. Applicants must provide a statement of intent, three reference forms, official transcripts demonstrating completion of a bachelor’s degree in a related field, a current resume, a minimum 3.0 GPA, and an application fee. Students may transfer up to 70 credits from approved accredited or non-accredited institutions. All credit transfers must be approved by the FPU registrar's office. FPU provides financial aid to over 90% of its students. Located in Des Moines, Iowa, Drake’s 150-acre campus hosts students from 40 U.S. states and over 40 countries. The university provides an exceptional educational experience with smaller-than-average class sizes. Beyond the classroom, Drake boasts a division one athletic program, notable for its standout athletes in both basketball and football. Drake offers a master of science in leadership development that prepares students to become leaders in the worlds of business, industry, and nonprofit management. The 30-credit program includes both online and in-person courses, which can be completed on weekends. Students can earn their master’s degree in under two years, taking one course at a time in a set sequence. Drake’s MS in leadership development offers two concentrations: leadership and talent development. The leadership concentration covers topics such as personality, persuasion, engagement, and intercultural relations, while the talent development concentration explores learning technologies, instructional design, facilitation, and performance counseling. Students must complete nine individual classes and one capstone project to earn the degree. Capstone requirements may differ slightly, depending on concentration. Learners may choose between a research paper and approved project directly related to leadership development. Applicants must have a minimum GPA of 2.5 and provide a statement of interest, resume, recommendations, and, in some cases, take part in an interview to be considered. Concordia University–Chicago offers a master's in organizational leadership online program that teaches students how to develop the skills needed to grow their organizations. In this program, students will learn methods for strategic planning, how to develop cutting-edge change initiatives and organizational diagnostic strategies, and how to create positive organizational change. The program also emphasizes essential communication, problem-solving, and decision-making abilities. Students can earn their online master's in organizational leadership in 24 months. The 33-credit online master's in organizational leadership curriculum is based on the belief that leaders must serve diverse communities ethically and efficiently while utilizing the resources of evolving technologies in an increasingly international marketplace. Core courses cover a variety of topics, including leadership and excellence, strategic leadership and planning, and ethical and social leadership. Students can also enroll in specialization courses that show them how to approach leadership as a mentoring role, develop self-reflective leadership styles aimed at promoting organizational renewal, and more. The program concludes with a capstone requirement that connects the concepts learned in past courses and serves as a transition between academia and career settings. The program is designed for adult learners and offers individualized faculty support for students. Courses are offered asynchronously online, allowing students to complete coursework at their own pace. The school offers an innovative tuition guarantee that locks in a student's tuition rate for the duration of the program, as long as they continually enroll in classes. Graduates are prepared to pursue careers as project managers, sales directors, military officers, hospital administrators, and religious leaders. The online master's of organizational leadership is well suited for those hoping to work in government, nonprofit, healthcare, higher education, military, or human services professions. MSOE was founded in 1903 by Oscar Werwath in Milwaukee, Wisconsin. Today, the school emphasize a practical approach in all its programs. In fact, 95% of MSOE graduates secure their prefered job or admission into their graduate school of choice. MSOE offers 11 graduate programs, including a master of science in engineering management with emphasis in organizational leadership program that emphasizes leadership and management skills valued by top employers. This program is taught by professors with real-world business experience and includes classes on topics like organizational leadership, sales and marketing, financial management, and international business. The average student earns their degree in 2-5 years depending on their course load. The online master's in leadership degree requires 45 credits, including core and elective courses, and culminates in a thesis project, which may be aimed at either solving a pressing problem or performing independent research as part of a case study. Students may choose to conclude the degree with a capstone project in lieu of a thesis, though the capstone is worth only three credits and requires additional electives to meet all degree requirements. The capstone includes an 11-week class in which students examine and propose a solution to a common business problem. Applicants must already possess a bachelor’s degree from an accredited institution with a minimum 2.8 GPA, and provide two letters of recommendation to be considered. Mercer was founded as a Baptist institution in 1833 in Penfield, Georgia. The school eventually broke ties with the Baptist church and moved its main campus to Macon. However, the school still emphasizes its founding ethics and principles. Mercer alumni include famous musicians, award winning writers, and successful attorneys, doctors, and politicians. Mercer offers an organizational leadership program with three concentrations: leadership and organizational development and change, leadership for the healthcare professional, and leadership for the nonprofit organization. The leadership and organizational development and change concentration is ideal for aspiring executives, community leaders, and consultants in any type of organization. Students learn how to guide employees toward realizing their full potential in a professional setting. The BLS estimates that the healthcare industry will grow faster than any other industry over the next 10 years. The leadership for the healthcare professional concentration prepares students to build systems for sustainable healthcare delivery and ensure the financial health of an organization. The leadership for the nonprofit organization concentration was created for professionals pursuing community leadership and equips graduates with advanced communication, problem solving, and critical thinking skills. Students explore in-depth various federal and state laws applying to nonprofits, as well as budgeting and fund development techniques. Students complete concentration courses in a blended format, including both online and on-campus coursework. This 31-credit program can be completed in just 18 months. Applicants must submit a minimum 2.75 GPA, qualifying MAT or GRE scores, a resume, a recommendation letter, and a leadership philosophy essay to be considered. Mercer is regionally accredited by the Southern Association of Colleges and Schools Commission on Colleges. Based in Mount Pleasant, Michigan, CMU serves over 20,000 students through more than 200 undergraduate, graduate, and doctoral programs. CMU alumni include professional athletes, famous entertainers, and esteemed professionals in the fields of science, medicine, business, and politics. The school offers a master of science in administration - leadership program that emphasizes management and leadership skills. This fully online MSA program prepares students for careers in both public and nonprofit sectors. Students explore enhanced strategic planning, fiscal management, and best practices in conflict resolution, communication, and efficiency. Mandatory classes include organizational dynamics and human behavior; administration, globalization and multiculturalism; and foundations of research methods in administration. Optional electives include professional ethics, labor relations issues, and gender and generational supervision. The curriculum includes a gender and generational supervision course that encourages students to explore the ways in which gender and generational differences reveal themselves in today's workplace, and how effective leaders can best manage these potentially delicate situations. Applicants must hold a bachelor’s degree from a regionally accredited institution with a cumulative 2.7 GPA or minimum 3.0 GPA in the final 60 semester hours of undergraduate coursework to be considered. They must also provide proof of competency in areas including financial accounting and statistics by demonstrating a passing grade in both financial accounting and statistics classes while obtaining their bachelor’s degree, or by passing a free competency assessment exam. Known for its commitment to both faith and knowledge, CUW offers academic programs in the Lutheran Christian tradition. CUW graduates enjoy a 90% job placement rate. The school offers a master of science in organizational leadership and administration program that is a good fit for aspiring CEOs, CFOs, HR managers, and marketing managers. The program emphasizes the development of a personal leadership style and teaches students necessary skills like communication, strategic thinking, and people management. This program also prepares students for the certified professional manager test through ICPM. Graduates of the OLA who also earn ICPM certification can demonstrate their knowledge of leadership techniques and apply them to professional scenarios. Distance learners have access to an online student success manager who helps guide each student through their entire educational experience. Online success managers can advise students on whether to add an optional graduate certificate to the OLA, and help them decide which concentration best aligns with their career goals. Available concentrations include marketing, management, international business, and human resource management. This 32-credit online master’s of organizational leadership program can be completed in just one year. Unlike some other business leadership degree programs, applicants do not need to submit GMAT or GRE scores. Application requirements include a one-page essay detailing their reasons for pursuing a graduate degree, a resume demonstrating work experience, two recommendation letters, and all official transcripts of their bachelor’s degree. CUW is regionally accredited by the Higher Learning Commission. Warner Pacific College prides itself on offering a personalized education experience, featuring a student-faculty ratio of 12-to-1. Originally founded in Spokane, Washington, the college since moved to Portland, Oregon, but it maintains its foundation in Christian values and principles. The school offers an online master’s of science in management and organizational leadership program that teaches students skills in business leadership, advanced research, and management techniques. Graduates qualify for executive management careers and have an advanced understanding of the modern, global business environment and how to implement their skills in a professional role. The online master's in organizational leadership degree program consists of 12 courses and can be completed in two years of full-time study. Most courses last for six weeks and students can submit assignments in their own time throughout the week. Students work in a cohort of 14-22 class members for the duration of the degree, allowing them to develop meaningful relationships with their classmates. Applicants must have a bachelor’s degree from a regionally accredited institution and submit an application, $45 fee, and official transcripts to be considered. They must also hold a minimum 3.0 GPA and have at least two years of work experience. Lincoln Christian University offers an online master's degree program in organizational leadership that prepares students to become role models, guides, coaches, and motivators in a faith-based context. Students in this online master's of organizational leadership will learn how to make strategic decisions and develop interpersonal skills to manage conflict. Professors are all leaders in their fields and have obtained a terminal degree in their subject area. They have an in-depth understanding of what qualities are inherent to the best leaders. The online master's in organizational leadership program at Lincoln is designed for working professionals and requires students to take one course at a time over 21 months. The curriculum covers a wide variety of topics, including foundations of organizational leadership, interpersonal leadership and organizational effectiveness, and strategic organizational leadership. Graduates will complete the program with a mastery of core leadership skills and a deeper understanding of God and a mission-centered life. To accomplish this goal, students will study major theories in leadership within a biblical context. Additionally, the program emphasizes the historical and theological foundations of leadership, encouraging students to ultimately conceive of management as a servant-leader role. Lincoln prides itself on the diversity of its programs and its organizational leadership students come from a variety of countries, including Papua New Guinea, China, and India. Graduates of the program have gone on to work in Fortune 500 companies, foundations, small businesses, ministries, and local and state governments. Applicants should have a bachelor's degree with a minimum GPA of 2.5 to be considered. Additionally, applications should include spiritual references written by individuals who work in Christian leadership roles and who can attest to the candidate’s religious character. Once admitted, distance learners will have access to a vast collection of digital resources, including 60 research databases, over 14,000 journals, more than 50,000 books, and several thousand videos. Established in 1858 in Baldwin City, Kansas, Baker claims the designation as the first university in the state. The school offers undergraduate, graduate, and doctorate degrees in four schools: the College of Arts and Sciences, the School of Nursing, the School of Education, and the School of Professional and Graduate Studies. Baker’s rich history includes a building dedication from Lady Margaret Thatcher and a personal donation from Abraham Lincoln. The school’s distinguished alums include fortune 500 CEOs, New York Times bestselling authors, and Super Bowl champions. Baker ranks among the 196 U.S. colleges and universities affiliated with the United Methodist Church. Baker offers a 39-credit master of arts in organizational leadership program that can be completed in just two years. Students develop modern leadership skills including critical thinking, group problem solving, and conflict resolution. Courses are delivered asynchronously in 6-8 week terms. Students complete coursework and participate in class discussions using Moodle, Baker’s learning management system and digital classroom. Instructors of the online master's in organizational leadership bring years of professional expertise to the program. This program holds national accreditation from the Accreditation Council for Business Schools and Programs. Established in 1929, Quinnipiac has since expanded into a national university with eight professional schools and three campuses. Today, 96.9% of graduates secure employment or gain admittance to advanced education programs within six months of graduating. Located in the picturesque New England town of Hamden, Connecticut, Quinnipiac maintains a reputation for turning out talented professionals in a variety of academic fields. The university built its foundation upon three core values: high quality academic programs, a student oriented environment, and a strong sense of community. Quinnipiac offers a master of science in organizational leadership program that emphasizes self-awareness and a capacity for empathy — two necessary skills for modern leaders. Students also explore corporate social responsibility, strategic thinking, and data driven performance improvement. Students in the master's in leadership online program can choose one of four specialization tracks: healthcare management, HR leadership, public service/nonprofit leadership, or strategic leadership. All tracks require 33 credits to complete, including 24 universal core requirements and nine elective credits, which differ depending on the concentration. The core curriculum includes courses on the foundations of organizational leadership, leadership across boundaries, and the power and politics of communication. The program concludes with a culminating capstone project. The School of Business at Quinnipiac is accredited by the AACSB, a distinction held by less than 5% of business schools. Professors are highly qualified, with 98% holding a doctorate or a terminal degree in their field. Applicants must have a bachelor’s degree from a regionally accredited school and a minimum of four years of work experience and must submit official transcripts, a current resume, and three letters of recommendation, one of which must be from a professional contact. CBU offers programs based on Christian faith frameworks, and employs an entirely Christian faculty and staff. The school offers associate, bachelor’s, master’s, and doctoral degrees to a student enrollment of nearly 10,000. The CBU Division of Online and Professional Studies (OPS) offers a master of arts in organizational leadership program that educates students to inspire and lead change within a variety of organizations. The program emphasizes decision making, communication, conflict management, and HR management skills, preparing graduates for executive management and leadership roles. Students can complete this 30-credit program online in just 12 months. The curriculum includes a conflict resolution and negotiations course that explores practical approaches to a broad range of common organizational conflicts, and students apply numerous analysis models, tools, and processes toward achieving favorable outcomes. The program also instructs student on leading diverse cultures and populations. This online Master's in Organizational Leadership program requires the completion of a capstone project, which provides students the opportunity to directly apply their learned skills to a professional scenario. Students demonstrate their content mastery by designing a needs assessment process to analyze a specific problem in a current company or organization, benchmark other organizations for ideas, and apply innovation solutions based on their research. The online online MS in organizational change leadership at UW-Platteville is designed for students who want to become better leaders by driving positive change and innovation within their organizations. The degree requires 30-39 credits, and full-time students who take nine credits per semester can earn their degree in as little as two years. Students have a maximum of seven years to earn their degree. Students can also customize their degree with an optional area of emphasis by completing six additional credits in one of the following areas: healthcare, project management, human resources and safety risk control. The curriculum includes foundational courses, core courses, electives, and the optional area of emphasis. This online master’s in organizational change leadership includes coursework on a variety of topics, such as intercultural change leadership, organizational behavior, and strategic thinking and change. For the final course of the program, students can choose between a capstone, seminar paper research, or thesis research project. The program can be completed entirely online with courses delivered through the Desire2Learn platform. Online students are represented by a virtual Student Advisory Board, which is made up of student volunteers who advocate for all distance learners. The Student Advisory Board advises the Center for Distance Learning and mentors both new and prospective students. Graduate transfer credits are approved on an individual basis, with credit also given for certain professional certifications. Transfer credit cannot exceed more than half of the required program credits. Applicants to this online master’s in organizational change leadership program should have a minimum undergraduate GPA of 2.75, or a minimum GPA of 2.9 in the last 60 credits earned. Students can begin the program in the fall, spring, or summer terms. All online students at UW–Platteville pay the same tuition rate, regardless of residency. Students can apply for several scholarships through UW–Platteville to reduce the cost of their degree. Lindenwood is a private liberal arts college that was founded in 1827 in Saint Charles, Missouri. The school has always strived to provide exemplary education to its students while upholding strong Judeo-Christian values. Today, the university offers 131 programs, including online degrees, and an enrollment of 10,000 students. Lindenwood offers a master of arts leadership program through the Robert W. Plaster School of Business and Entrepreneurship and the Department of Management. This online master’s in leadership prepares working professionals for a variety of leadership roles, emphasizing essential skills in organizational communications and development, financial policy, personnel law, and business operations. This 36-credit program can be completed in just five terms of full-time study. The curriculum includes 10 foundational courses on topics like management practices and leadership theory, and two electives of the student's choice. Optional electives include employee training and development, group and team dynamics, business law and ethics, and organizational behavior. The group and team dynamics course focuses on how the contributions of separate teams factor into the proper functioning of an organization as a whole. Topics include various role dynamics, work habits, and decision making behaviors. Graduates are prepared to pursue careers in consulting firms, human resources departments, and higher education. Applicants must hold a bachelor’s degree and a minimum 3.0 GPA. The program may require additional prerequisites for some candidates, which are determined on a case-by-case basis. Lindenwood is regionally accredited by the Higher Learning Commission. Located in Melbourne, Florida, FIT is the only independent technological school in the Southeast U.S. Since its establishment in 1958, the school has upheld its mission to provide outstanding education to a diverse student body, preparing graduates for success in the global workplace. The school offers a 33-credit online master of arts in organizational leadership program that can be completed in two years by enrolling in one course at a time. The program offers accelerated eight-week terms, which are ideal for working professionals. The curriculum prepares graduates for leadership roles within an organization or community by combining the science of leadership with practical development strategies and skills. This online master’s in leadership includes coursework that emphasizes both private and public sectors across multiple industries. Students complete foundational courses in classic leadership literature and apply their knowledge to professional scenarios. The program encourages learners to pursue work experience in an organizational leadership area of interest while earning the degree. The curriculum includes courses on talent management, which introduce students to workforce planning, recruitment, and onboarding techniques; communication, including both verbal and written competencies; and analytics, which explore how to use data to improve the decision-making process. Applicants must possess a bachelor’s degree and provide two letters of recommendation, a current resume, a statement of intent, and official transcripts from all previous university coursework to be considered. FIT's administration team also considers an applicant's cumulative GPA and professional work experience on a case-by-case basis. St. Mary’s University of Minnesota offers an online master's of organizational leadership program that teaches students how to develop key leadership attributes like analytical and interpersonal skills. This online master’s degree in leadership aims to serve working adults who are changing careers or seeking a pay raise. The median student age is just over 30, and most distance learners come from careers in the non-profit, government, or industry sectors. Graduates are prepared to pursue management roles in a variety of public, private, or nonprofit settings. The 36-credit online master's in organizational development is broken into five segments, each with a separate focus. The first, the learning leader, is designed to develop students' ethics, critical thinking, and leadership styles. Students then focus on teamwork skills, cultural and political competency, and talent management skills during the connected leader, the global leader, and the change leader phases. The curriculum concludes with the adaptive leader segment, which synthesizes the skills learned in the previous phases and emphasizes strategy and innovation. During this phase, students will complete a three-credit capstone symposium that involves researching, writing, and proposing a solution for positive organizational change. Students can earn their master's in leadership online in just 20 months of full-time study. St. Mary's offers a wide variety of resources and support to distance learners. Once admitted, all distance learners receive an iPad that is programmed with the school's mobile learning platform, making it simple to access coursework. Additionally, students enjoy full access to St. Mary’s online library databases and extensive interlibrary loan partnerships. The online library databases provide students with access to over 200 million virtual resources, and allows them to have books mailed directly to their place of residence. Trevecca Nazarene University in Nashville offers an interdisciplinary online master's in organizational leadership (MOL) to students looking to take the next step in becoming effective leaders. The program emphasizes communication, religion, and business in equal measure to provide students with a balanced perspective on leadership. The program can be completed in just 20 months. Trevecca’s 33-credit online organizational leadership master’s degree program is broken into three sections: personal leadership development, interpersonal/group leadership, and organizational impact. Each level is strategically designed to help students define what type of leader they want to become. The program’s three phases aim to help graduates form a better understanding of their organization’s unique business culture and develop best practices for positively impacting their team members. The program also emphasizes teaching its students how Christian leadership is necessary in local, national, and global communities. Students will also explore the servant leadership model, a method that approaches problem-solving, upholding an organization’s values, and decision-making as a means of serving others. The university offers a wide variety of resources for distance learners, including access to school's extensive online library databases of eBooks, newspapers, academic journals, and video collections. All online programs at Trevecca are offered in an asynchronous format, allowing students to complete coursework at their own pace. Students can transfer credits from other institutions as long as they were earned within the past 10 years with at least a "B" grade. They can also earn credit for prior learning experiences, such as military service or professional licensure. Trevecca works with many employers to provide tuition reimbursement and offers benefits to students affiliated with the military through the Yellow Ribbon Program and GI Bill. Located in St. Davids, PA, Eastern University was founded in 1925 but became a separate institution from Eastern Baptist Theological Seminary in 1952. This private Christian institution now enrolls over 2,000 students and the average class boasts a student-to-faculty ratio of 10:1. The school’s online programs use the same faculty and curriculum as their campus-based courses, and teachers apply a holistic approach when assisting students. Eastern’s master of arts in organizational leadership program features concentration tracks that emphasize social entrepreneurship and public advocacy. Classes are asynchronous and require student interactions with recorded lectures, archived cases studies, and group breakout areas. The program takes approximately 20 months to complete, and is comprised of core courses that include spiritual formation for Christian leaders, practical financial management, and fundraising for non-profit organizations. The concentration track courses total 30 semester hours of the program and require the completion of multiple projects and a thesis. Admission into the online master's in organizational leadership program requires a bachelor’s degree from an accredited institution and to maintain a 2.5 cumulative grade point average. Students access their coursework through the Brightspace learning management system, which provides access to discussion boards, lectures, and group activities. Eastern's online master's in leadership program has partnered with organizations including World Vision, Habitat for Humanity and International Justice Mission. Application deadlines are rolling and students will continue to be placed in classes until they are filled. Eastern University receives accreditation from the Middle States Commission on Higher Education. Formerly Christ College, Concordia University-Irvine is a private Christian institution established in 1972. Located in Southern California, CU-Irvine enrolls over 4,000 students, and is one of 10 schools that make up the Concordia University System. The university’s online programs features a synchronous learning experience where students meet with teachers online and interact with course materials once they are available. The school’s online master’s in organizational leadership program was designed by Dr. John Townsend of the Townsend Institute, and is managed by Dr. Townsend, the Institute Fellows, and select faculty members. The length of the program varies from 12 to 20 months, and students complete 33 units to graduate. The curriculum features 27 units of core coursework in leadership and transformation, building healthy culture and performance, and organizational leadership and character development. A three-unit capstone course is also mandatory, where students create a scholarly article to present at the Townsend Institute’s annual conference. Additional coursework features two general electives courses in topics like executive coaching, developing the executive coaching relationships, and systems and project management. Eastern also uses a cohort model of study; students start the program with the same group of peers and complete coursework together until graduation. Admission requires students demonstrate a 3.0 cumulative grade point average, the submission of two professional essays, and an official transcript from another regionally accredited institution. Info nights are available for incoming professionals to demonstrate how class sessions, Institute Fellows, and faculty affect the learning experience in the online master of organizational leadership program. Concordia University-Irvine maintains regional accreditation with the WASC Senior College and University Commission through 2024. Stationed in the heart of the Boulder, CO, the University of Colorado Boulder is one of 34 United States public research institutions belonging to the Association of American Universities and the only one in the Rocky Mountain region. Established in 1876, the university opened its doors five months before the state of Colorado was inducted into the Union. CU is the flagship school of the University of Colorado system and has a current enrollment of over 33,000 students. The University of Colorado Boulder’s online master of science in organizational leadership program features asynchronous coursework and application-oriented assignments. The program offers three tracks in which students can specialize their studies: human resources, strategic leadership, and a general organizational leadership option. To graduate, students complete 30 credits spread over 10 courses, with each course lasting seven weeks. Students in the master's in leadership online program complete six different courses in core studies including analytics and data-driven decision making, performance management, leadership and organizations, and strategic communication. The curriculum culminates in a capstone class where students work with faculty to demonstrate various analytic methods and data collecting techniques learned throughout the program. Admission into the program requires a 2.75 cumulative grade point average as well as two professional references. Graduates from the program pursue careers with companies including Verizon, NASA, Google, and Microsoft. CU Boulder uses a cohort format of study where students progress through the program with the same group of peers. A 2018 study conducted by US News & World Report ranked the university as one of the top 100 schools in the nation. CU continues to receive regional accreditation from the Higher Learning Commission and is reviewed through 2020. Creighton University is a private Jesuit institution located in Omaha, NE that was established by the Society of Jesus in 1878. With over 8,000 students enrolled in campus-based and online programs, the university offers nine different undergraduate, graduate, and professional interdisciplinary curriculums. The student-to-faculty ratio is approximately 11:1 and most classes enroll roughly 20 students. In 2018, US News & World Report ranked Creighton University as the number one educational institution in the Midwest region. The school’s master of science in organizational leadership degree is a 36 semester hour program that features a blend of core and elective courses. Program core courses makeup 18 semester hours and include classes such as approaches to human capital, communicating and leading across cultures, and strategic orienteering and execution tactics. A required leadership capstone course lets students work with faculty to demonstrate the fundamentals behind leadership, communication, and management. The final 18 semester hours are earned via electives, which can be earned through concentrations or coursework in different programs. Online courses are asynchronous and use the Blueline operating system to communicate with professors and complete assignments. Graduates from the program often pursue occupations as instructional coordinators, human resource managers, and education administrators. To gain admission to the online master’s in organizational leadership program, applicants must have two years of full-time work or leadership experience, a minimum 3.0 cumulative grade point average, and a 500-word personal statement. Online classes receive the same curriculum and faculty as their campus-based counterparts. Creighton maintains regional accreditation from The Higher Learning Commission of the North Central Association of Colleges and Schools and will receive its next review in 2026. Established in 1858 in Southern Minnesota, Winona State University is the first tax-supported school to be created west of the Mississippi River. This comprehensive public institution now enrolls over 8,000 students in campus-based and online programs. It is also the oldest school in the Minnesota State Colleges and Universities system, and offers 80 different undergraduate, graduate, and professional degree programs. The university is on a semester-based academic calendar and online courses offer the same curriculum and faculty as their campus-based counterparts. WSU’s master of science in leadership education and organizational leadership program is a 33-credit blend general education courses, electives, and an organizational leadership core. The leadership education core requires five courses such as the common good, systems thinking, and communication. Electives make up the final six credits, and an academic advisor assists in the creation of a student-specific graduation plan to provide career and job-specific knowledge. Courses in the organizational leadership core include project management; leadership and technology; and managing change, innovation, and transition. A capstone writing requirement is required for graduation, and candidates work with a thesis or capstone advisor to complete a research paper that emphasizes organizational leadership skills. Admission into the program requires applicants to have a 2.75 cumulative grade point average and a personal statement outlining their personal experiences. The online master of organizational leadership degree has been peer-reviewed by faculty outside of the institution and meets national curriculum standards set by the Quality Matters program. A 2018 US News & World Report study ranking best school values placed WSU within the top 100 regional Midwest institutions. Winona State University receives regional accreditation from the Higher Learning Commission. Belhaven University is a private Christian liberal arts college located in Jackson, MS. Founded in 1883, BU has an enrollment of more than 4,600 students and a student-faculty ratio of eleven-to-one. The university offers over 70 programs of study and was recognized in a recent US News & World Report study for being one of the top 100 educational institutions in the Southern regional area. BU’s 36-credit master of science in leadership degree develops professional skills in business, leadership, church, and educational roles. Classes are asynchronous and professors announce coursework and deadlines at the beginning of each semester. Students build custom graduation plans with their academic advisors and can complete the degree in normal or accelerated formats. The school uses a semester-based academic calendar and classes are taught in eight-week terms. Courses in the master's in leadership online program include ethical problems, leading productive teams, principles of executive leadership, and the legal environment of business. Students also must complete a capstone seminar in organizational leadership. Applicants must possess a 2.5 cumulative grade point average in their undergraduate work. Students are required to purchase textbooks for their online studies and can access course records to prepare for each course. Students can transfer up to six credits from other regionally accredited institution, and prior work experience will also be considered. The university receives accreditation from the Southern Association of Colleges and Schools Commission on Colleges for both its campus-based and online programs. Belhaven also takes part in The State Authorization Reciprocity Agreement which makes it easier for out-of-state students to enroll in online classes. The MSED in organizational leadership at Newman University teaches students the skills needed to pursue leadership positions in a variety of settings, from military and government to healthcare and education. While the program is designed to be completed in two years, students can earn their degree in as few as 14 months, or slow down the pace of the program. The program offers start dates in the fall, spring, or summer semesters, though there must be enough students to create one cohort. This master's of science in education in organizational leadership does not require candidates to have an education license. The 33-credit organizational leadership graduate program includes 11 courses and is designed to help students become successful leaders in today’s multicultural, interconnected businesses. Courses are eight weeks long and include a combination of delivery methods such as face-to-face, video conferencing, recorded courses, and interactive online courses. Throughout the program, students will compare a variety of leadership styles and coaching models, allowing them to form their own holistic approach to leadership. Courses such as leadership coaching techniques and multiple leadership coaching application classes prepare graduates to mentor and coach others to help them achieve their full potential. Students who complete all three of the leadership coaching application courses can pursue an ACC-level credential with the International Coach Federation. Other courses in the online master’s degree in leadership include cultural diversity, facilitation strategies, and an optional 16-week organizational leadership project. Application requirements for this online master’s in organizational development include an online application, official transcripts, a writing sample of 300 words or less on an applicant’s philosophy of leadership, and two references that must include one supervisor reference. They must have also earned an undergraduate degree with a minimum GPA of 2.75 to be considered. Founded in Roseville, MN in 1902, the University of Northwestern - St. Paul is a private non-denominational evangelical Christian institution. The university boasts a student enrollment of over 3,000 across campus-based and online graduate programs. Over 80 degree options for undergraduates and graduates are available and the student-to-faculty ratio is approximately 14:1. Online courses use the same curriculum and professionally trained faculty as their campus-based counterparts. Northwestern’s 36-credit master’s in the organizational leadership program takes approximately 18 to 22 months to complete. Coursework is asynchronous and includes topics such as data analysis for decision making, personal growth for effective leadership, strategic leadership, and human resource leadership. The final six credits of the curriculum are split between a capstone project overseen by a program advisor, and a program evaluation course that measures students application and knowledge of the curriculum. Graduates from the online master of organizational leadership degree pursue occupations in fields including human resources, recruiting, community service, and church-based roles. Students can attend information sessions before starting the program to understand the requirements and goals of the program. Students have unlimited access to course tools, notes, and textbooks while enrolled in the online program, and can communicate with professors throughout their studies. US News & World Report ranks the school as one of the 50 best educational institutions in the regional Midwest area for 2018. UNW continues to receive regional accreditation from the Higher Learning Commission through the end of 2018. The school is also recognized by the State of Minnesota Department of Veterans Affairs to offer training to veterans, survivors, and dependents in the family. Situated along the Hudson River in New York City, Mercy College is a private non-sectarian research institution established in 1950. Mercy offers over 90 graduate and undergraduate programs and has multiple campus locations in Manhattan, Bronx, and Yorktown Heights. Currently, over 11,000 students are enrolled in online and campus-based programs, and the university emphasizes learning experiences outside of the classroom to generate real-world experiences. The school follows a quarter-based academic system and students are required to enroll in one to three courses per quarter once admitted. Mercy College’s 33-credit master of science in organizational leadership program features synchronous coursework in topics such as practicing ethical leadership, developing learning systems, building sustainable organizations, and implementing change initiatives. Students also complete a capstone preparation seminar that develops a research project focused on professional development. Graduation from the online master's in leadership program requires a 3.0 cumulative grade point average and completion of all coursework within five years of the professional’s date of matriculation. Graduates pursue careers in fields that include government, human resources management, and business management. Admission into the program requires students to demonstrate a 3.0 cumulative grade point average in their undergraduate work, and a written statement explaining one’s personal and professional interest in the school. Mercy helps students navigate their college experience and participates in the nationally recognized mentoring program known as College’s Personalized Achievement Contract. The university maintains full regional accreditation from the Middle States Commission on Higher Education. The school also partners with the Department of Veteran Affairs and has provides veterans and their families with quality educational opportunities available in the Yellow Ribbon Program. The University of Kansas is a public research institution founded in 1865 near the city of Lawrence, KS. KU has been a member of the Association of American Universities since 1909, and consistently provides nationally ranked academic programs. A 2018 US News & World Report study, for example, placed the school’s interdisciplinary programs within the top 150 universities around the country. Over 28,000 students are enrolled in undergraduate and graduate courses across five different campus locations. Approximately 50% of available courses enroll less than 20 students and the student-faculty ratio is 17:1. The school offers 370 degree programs in both campus-based and online formats, while more than 100 programs of international study and cooperative research are available. UK’s 30-credit master of science in business and organized leadership program can be completed in 10 months. Up to six credits may be transferred from a regionally accredited institution and prior work or life experience is also considered for credit. This program uses a hybrid curriculum in which 12 credits must be completed within the classroom and another 12 credits available in online formats. Core courses include management skills and teams, marketing, managing people, and ethical decision making. A required two-credit leadership capstone and six credits of advanced leadership electives round out the degree. Classes are asynchronous and students can complete courses at their own pace. Graduates from the online master's in leadership program often pursue careers in fields including education administration, human resources, and training and development. The university has continuously maintained regional accreditation since 1913 by the Higher Learning Commission of the North Central Association of Colleges and Schools. Medaille College is a private liberal arts institution located in Buffalo, NY. Founded in 1937, the school’s liberal arts and science curriculum emphasizes interdisciplinary coursework and practitioner-based learning environments. The university enrolls over 2,700 students across its graduate and undergraduate programs, and offers seven different graduate programs in campus-based, hybrid, and fully online formats. The academic calendar follows a semester-based format and online courses use the same faculty and curriculum as their on-campus counterparts. The school’s master of arts in organized leadership degree is a 30-credit program in which students complete anywhere from one to four classes each semester. Courses are seven weeks in length, and students can complete the program in approximately one year. Classes are asynchronous and coursework can be completed any time throughout each semester. The curriculum includes nine core leadership courses that apply various theories and concepts of leadership in business environments, including diversity in organizations, executive finance, leading and technology, and systems thinking. A three-credit leadership capstone is also required, where students assess their personal development in the program and apply various models and theories to a selected area of research. Graduates from the online master of organizational leadership program pursue careers in areas including health service management, talent training directors, chief executive officers, and human resource management. Medaille has a rolling admissions deadline and students are enrolled until classes are full. A recent study conducted by US News & World Report placed Medaille within the top 200 North regional universities. Medaille maintains regional accreditation by the Middle States Commission on Higher Education. The institution’s business programs also receive special accreditation from the International Accreditation Council for Business Education. Resting along the border between Idaho and Washington, the University of Idaho is a land grant and public research institution located in Moscow, ID. Founded in 1889, U of I’s flagship school is the oldest university in the state. With satellite campuses in Coeur d'Alene, Boise, and Idaho Falls, the university enrolls approximately 11,500 students across its undergraduate and graduate programs. U of I offers over 80 graduate programs in campus-based and online formats, and adheres to a semester-based calendar. The university is also ranked as one of the top 100 public schools in the nation by a 2018 US News & World Report study. U of I’s master of science in adult organizational learning and leadership degree is customizable and can be completed at a pace that fits a student’s lifestyle. Students can select either a thesis or non-thesis emphasis, and up to 12 credits can be transferred from another regionally accredited institutions. The program core is comprised of 21 credits that includes course options such as the future of education and work, organizational development, adult and transformational learning, and organizational leadership. Professionals in the program can also complete six elective credits with a research internship. Following advisor approval, students on a thesis track complete 12 credits in various research and analysis courses. Students in the non-thesis option complete a three-credit course as well as finish a comprehensive exam or research project. Application deadlines are rolling and students admitted to the university can apply for financial aid. The University of Idaho’s online master's in organizational leadership program adheres to the same curriculum and course standards as all campus-based operations. Graduates from the program often pursue careers in fields including training consultant, instructional designer, and human resource specialist. Since 1918 the school has received regional accreditation from the Northwest Commission on Colleges and Universities. Cornerstone University is a private Christian institution based in Grand Rapids, MI. Founded in 1941, the school now offers over 100 different programs across its undergraduate, graduate, and professional studies. With an enrollment of over 3,000 students in campus-based and online courses, the university features a low student-to-faculty ratio with approximately 56% of classes enrolling under 20 students. Available online graduate programs include business, education, psychology, human services, and ministry. Cornerstone’s 36-credit master of arts in organizational leadership degree features synchronous coursework that students can complete in 18 to 20 months. To gain admission, applicants must demonstrate either a 2.7 cumulative grade point average along with one year or more of work experience. Students with less than one year of work experience will need to maintain a 3.0 cumulative grade point average. Applicants must also provide two letters of recommendation and submit a professional resume. Coursework is comprised of 11 different subjects that includes human resource leadership, employee development and performance management, managing and maximizing diversity, and organized decision-making. Students also complete a three-credit organizational leadership capstone course in which they develop a leadership performance plan. An academic advisor works with students to identify leadership strengths and opportunities where they can improve. Graduates are prepared for leadership roles at higher education institutions, non-profit organizations, and religious institutions. The master's in leadership online program adheres to the same curriculum and faculty as its on-campus counterpart, and a 2018 US News & World Report study ranked the school as one of the top 150 universities in the regional Midwest area. The university receives regional accreditation from The Higher Learning Commission of the North Central Association of Schools and Colleges. Established by the Society of Jesus in 1851, Saint Joseph University is a private Jesuit institution located in Philadelphia, PA. It is the seventh oldest Jesuit college in the United States and the the school enrolls about 9,200 students throughout its undergraduate, graduate, and certificate programs each year. SJU offers 53 different graduate programs in campus-based and online formats and the average student-to-faculty ratio is about 12:1. The university’s online master's in leadership program is on a semester-based academic calendar and courses are synchronous. Students in Saint Joseph University’s 36-credit master of science in organizational development and leadership degree can complete the program in two years. Core courses include leading teams, organizational change and culture, research design and evaluation, and organizational leadership. A six-credit residency in facilitating change is required for core course requirements, and is organized into various clinics that focus on themes like facilitative leadership, team leadership, and implementing change. Students enroll in four elective courses that include career development, learning design and implementation, and the coaching leader. Online students also have the option to take a seminar in global issues that involves a hands-on tour with faculty and a focus on social diversity in education, business, and social justice environments. The application deadline is rolling and, on average, 90% of students who apply for financial aid receive some type of compensation. Saint Joseph University receives regional accreditation from the Middle States Commission on Higher Education. SJU’s school of business is also accredited by the Association to Advance Collegiate Schools of Business. The university was ranked as the fourth best higher education institution for veterans by a 2018 US News & World Report study. Established in sunny San Diego, CA in 1902, Point Loma Nazarene University is a private Christian liberal arts college with over 4,400 students in its undergraduate, graduate, and certification programs. With a student-to-faculty ratio of 15:1, approximately 40% of classes enroll fewer than 20 students. PLNU follows a semester-based academic calendar and offers 39 different graduate programs in campus-based and online formats. A 2018 US News & World Report study ranked the university 16th among schools across the nation in regards to the value its programs offer to the student body. Point Loma Nazarene’s 36-credit online master’s in organizational leadership can be completed in 20 months. Classes are held in an asynchronous format and are designed to be collaborative learning experiences between students and faculty. The program also uses a cohort model of study, where students progress through courses with the same peers. Students can enroll in a completely online format or pursue a hybrid degree structure where they meet once a week with faculty at the Mission Valley campus in San Diego. Coursework includes assessing leadership skills, organizational communication, leading in diverse communities, and financial reporting in organizations. Graduates of the online master's in organizational leadership program pursue career paths such as management analysis, corporate planning, human resources management, and small business operations. Online orientation begins one week before the program start, and students can apply in spring, summer, or fall semesters. Applicants must have 3.0 cumulative grade point average and hold a bachelor’s from a regionally accredited institution. PLNU has received regional accreditation from the WASC Senior Colleges and Universities Commission since 1949. The institution’s school of business also receives accreditation from the Accreditation Council for Business Schools and Programs. The complexities of managing groups of people is a popular area of study for many business students who want to enhance their skill set and acquire greater earning potential. The length of most online master's in organizational leadership programs is around 30 credit hours, and can be completed either full time or part time. Students can expect to gain expertise in management techniques and philosophies, in addition to specializations according to their desired program. When deciding which master's in leadership online program to attend, it is important to consider the fact that individual programs may differ. Some online master's in organizational leadership focus on different aspects of the industry. Finding an example curriculum of an online organizational leadership master's degree can tell a lot about a program. Strategic Human Resource Management: Highlights the role of training and HR departments in performing the necessary tasks associated with recruitment, training, career development, and hiring within organizations. A foundational overview in collective bargaining, regulatory procedures, and affirmative action requirements are also emphasized as they relate to the intricacies of how an organization ensures its own success. Globalization, Change and Learning: Students develop a greater appreciation of the ongoing effects of the Information Age in terms of how companies trade and market themselves internationally. A focus on globalization and its effects on human relationships better prepares a student to navigate public relations expectations in a complex and fundamentally interconnected worldwide marketplace, equipping them with valuable problem-solving skills. Leadership in Organizations: Students are exposed to a large body of literature around organizational leadership. They will also read about different theories and approaches. Analysis and research techniques around empirical business challenges are emphasized, with a focus on how contextual technicalities and levels of analysis (team, community, organization) may factor into the decision-making process in nearly any business setting. HOW LONG DOES IT TAKE TO GET AN ONLINE MASTER'S IN ORGANIZATIONAL LEADERSHIP? All master's in leadership online programs have a set number of credit requirements for graduation, but the length of time that a student may need to complete that program may differ. Some students may possess coursework from another previously attended institution. Any accepted transfer credits will shorten the length of the program. Students will encounter eight to 12-week course lengths. Some programs also require that students enter a program in a cohort, which has students follow a synchronized instruction. A cohort model will typically take longer to complete than asynchronous studies. Students can complete a 30-33 credit online master's in organizational leadership program in two years. Project Risk Management Certificate: Exposure to the holistic perspective of project risk assessment equips a student with fundamentals in process-oriented thinking in order to prepare them for project management roles. Proven methodology, concepts, and best practices from real businesses help to guide a student in learning to assess scope, schedule, resource availability, and other constraints in terms of a given business project. Management for IT Professionals Certificate: A Management for IT Professionals certificate would be suited to any student who has a desire to assume management within an IT company, or who plans on working in IT upon graduation. This certificate focuses on culture in work organizations and how it influences the people that work there. Standards and codes of conduct for long-term health, the importance of roles, and essential business practices are all emphasized. Regional accreditation is a voluntary process undergone by a university in order to demonstrate to potential employers and licensing agencies that their programs meets a minimum standard of excellence. Regional accreditation is considered by some to be more prestigious. National accreditation tends to be associated with for-profit colleges and universities. There is no specific accreditation required in addition to regional or national accreditation regarding the best online master's degree in leadership. This is important when considering how your degree may or may not be recognized in terms of a potential transfer to a Ph.D. program or application for a corporate position with accreditation requirements. The Department of Education exists to regulate policies concerning all schools and colleges, coordinate federal assistance for education, gather data about schools, and enforce federal laws regarding education. It strives to promote the success of education within the U.S. and has no direct hand in the accreditation process itself. Organizations such as the Council for Higher Education Accreditation (CHEA) create, issue, and archive the records of a school's or college's passing of inspections. The CHEA and similar bodies strive to maintain educational and judicial standards that remain competitive with colleges and schools in the US, as well as around the world. Interested applicants may look for one of the seven organizations that make up the Council of Regional Accrediting Commissions: the Middle States Commission on Higher Education, the New England Association of Schools and Colleges, the Higher Learning Commission, the Northwest Accreditation Commission, the Southern Association of Colleges and Schools, the Western Association of Schools and Colleges, or the Accrediting Commission for Community and Junior Colleges. A list of colleges with national accreditation is available directly from the US Department of Education. Due to the multidisciplinary nature of organizational leadership, students who graduate with a master's degree in this field pursue a wide range of career paths. The job outlook for organizational leadership professionals will largely depend on their specific job title. The following table features the unemployment rates for six common occupations related to organizational leadership. Each entry was included on the 'Best Business Jobs' list published by U.S. News & World Report in 2016. The average unemployment rate of all six occupations listed is 3.35%. By comparison, the national unemployment rate for all industries currently sits at 4.6%. According to the 2015-16 PayScale College Salary Report, students who graduate with a master's in organizational leadership will earn a median annual salary of $52,400 during their first five years and $85,000 after 10 years on the job. Comparatively, those with a bachelor's in organizational leadership earn $43,900 and $63,300 at the five- and 10-year marks, respectively. How does organizational leadership stack up in terms of early-career earnings? The following table explores salary projections for four organizational master's fields. In addition to master's degree field, it's also important to note that salary expectations for organizational leadership professionals also vary by specific job title. The next table looks at career earnings projections and growth for five of the most common careers in organizational leadership. All five occupations listed in the table reported career salary growth of at least 26%. Management consultants experienced the highest growth rate: a 73.6% increase between the entry-level and mid-career stages. Operations placed second with 44.5% earnings growth after 20 years on the job, followed by managers (change management) with 37.1% growth. Students who graduate with a master's in organizational leadership will be qualified for dozens of top-level positions, although individual eligibility will depend on additional factors like company size and city/state of employment. Four of the most common career pathways in organizational leadership are detailed below. Top Executives: Top executives develop strategies and productivity goals for the employees in their company or organization. They analyze company data in order to create feasible objectives, and then monitor and evaluate personnel in order to ensure these goals are met. Executives often have a hand in recruitment, hiring and employee training, as well. Administrative Services Managers: These managers oversee the supportive functions of their company or organization, such as hiring, logistics, technology support and facilities management. In larger work settings, administrative services managers may supervise recordkeeping, security, mail and other specific departments. Training and Development Managers: These managers develop, implement and evaluate the training and professional development programs at their company or organization. They analyze data and employee records in order to create applicable programs, and then evaluate program outcomes to ensure personnel are receiving adequate instruction. Human Resources Managers: Human resources managers (also known as HR managers) coordinate the administrative services of their company or organization. They often play a direct role in recruiting, interviewing, screening, hiring and training new employees. They also assist employees with work-related issues. Making professional connections and learning about different approaches to organizational leadership is crucial to your success. Professional organizations offer a great entry point for students who want to learn more about their chosen career path. Below you'll find three of the country's most prominent organizations established for organizational leadership professionals. These organizations host networking events, provide online trainings, maintain active job boards, and offer other services for career-ready college graduates. Resources like these often prove invaluable as you complete your degree requirements and prepare to enter the job market.